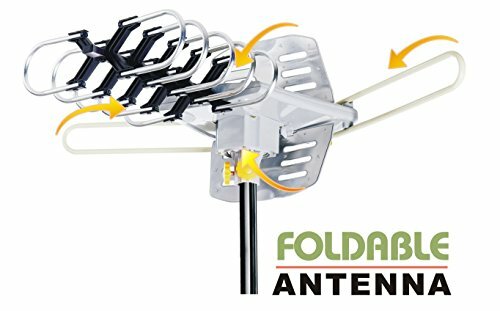 Amplified HD Digital Outdoor HDTV Antenna with Motorized 360 Degree Rotation, UHF/VHF/FM Radio with Infrared Remote Control for 2 TVs -Installation Kit by BoostWaves at Home Entertainment Centers Online. MPN: WA-2068.Boostwaves. Hurry! Limited time offer. Offer valid only while supplies last. THIS IS OUR BEST ANTENNA BY BOOSTWAVES ON THE MARKET WITH SOLID CONSTRUCTION AND HIGH QUALITY MATERIAL TO WITHSTAND WEATHER CONDITIONS ON YOUR ROOF! THIS IS OUR BEST ANTENNA BY BOOSTWAVES ON THE MARKET WITH SOLID CONSTRUCTION AND HIGH QUALITY MATERIAL TO WITHSTAND WEATHER CONDITIONS ON YOUR ROOF! BoostWaves Trademark INSTALLATION KIT INCLUDES 50FT COAXIAL CABLE, 25 CABLE CLIPS, 20 CABLE SAFETY TIES. SPECIFICATION: FREQUENCY RANGE 47-860 mhz Gain 20-28db Reception Range: up to 125 miles Frequency: (VHF)40-260MHz Frequency: (UHF)470-860MHz VHF Gain: 25±3dB UHF Gain: 30±3dB Impedance: 75 ohm Max.Rotation: 360 Degree Rotating Speed: 4-6 rounds/min Power: 3W Working Voltage: AC 110V /60HZ Reception Range: 125 miles Package includes: 1-Antenna Main Unit 1- Redirector 1- Power Box 1- Remote Control 4-Screws 1x 50ft Coaxial Cable 25x Cable Clips 20x Safety Ties(plastic tie downs) 1x Instruction. MAKE SURE YOU RECEIVED AN ANTENNA WITH THE BOOSTWAVES TRADEMARK LOGO. BOOSTWAVES IS A TRADEMARK OF UNIQUE IMPORTS. Gain 20-28db - Channel: VHF1-12 UHF21-69 -2016's NEWEST MODEL!! If you have any questions about this product by BoostWaves, contact us by completing and submitting the form below. If you are looking for a specif part number, please include it with your message. 8th team TV Key, HDTV FREE TV Digital Indoor Antenna 1080p Ditch Cable.